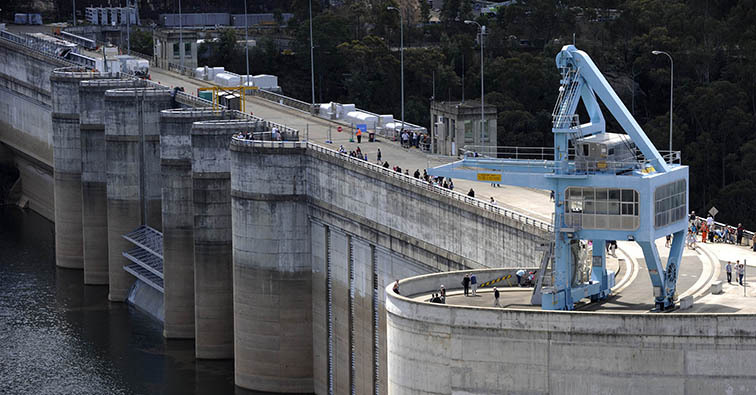 Look out at Warragamba Dam and see the past and future of Sydney's water supply. 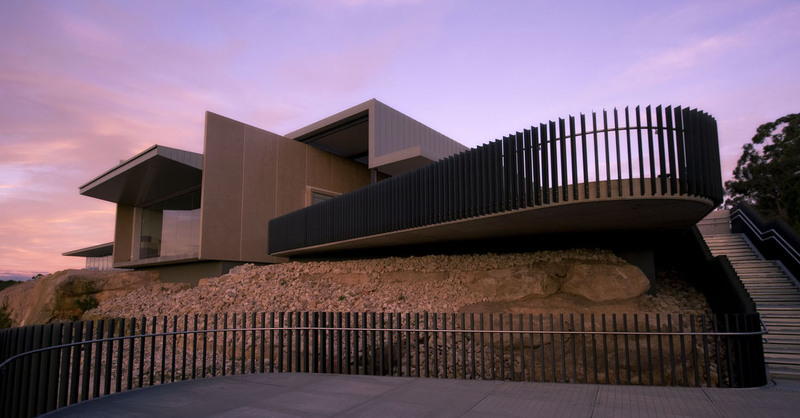 Marvel at this engineering masterpiece as it nestles quietly in native bushland. Delve into the history of the dam builders who laboured to create one of the world's largest domestic water supply dams. 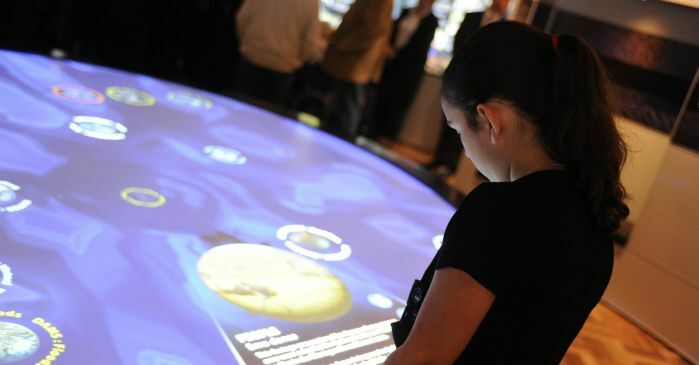 Look into the future at the interactive 'Water for Life' exhibition. Just a 30 minute drive from Penrith, or one hour from Sydney's CBD, bring the family and escape the everyday at Warragamba Dam. There are three viewing platforms at the Warragamba Dam Visitor Centre which offer excellent vistas of the upstream dam wall and Lake Burragorang. Pedestrian access to parts of Warragamba Dam wall is available on weekends and public holidays ONLY between 10am and 4pm , except Christmas Day and Good Friday. A mobility bus will be available on the 1st Sunday of every month and public holidays (except Christmas Day and Good Friday). A few minutes drive from the dam through the Warragamba township, the Eighteenth Street Lookout provides a view of the auxiliary spillway and a distant view of Warragamba Dam wall. Open daily from 10am to 5pm. Take a 40 minute drive from Warragamba Dam to Burragorang Lookout, managed by National Parks and Wildlife Service, the lookout offers panoramic views of Lake Burragorang. Warragamba Dam is about 65 kilometres, or a one hour drive, west of the Sydney CBD. Take Silverdale Road and Production Avenue to Warragamba Dam. Stand on one of the viewing platforms and have your photo taken with the 'quiet beast'. Warragamba Dam's nickname comes from the fact that three million tonnes of concrete is holding back four Sydney Harbours of water, yet the atmosphere is calm and peaceful. It was an engineering masterpiece of the mid-20th Century - and it still takes your breath away today. Take a self-guided walk around the dam grounds and discover the history of this monumental undertaking. Interpretive signs and heritage items along the way reveal the stories behind the dam's construction. Pause at the Workers' Memorial and pay your respect to the 14 dam builders who died during construction. Gaze down upon the dam wall and a small part of Lake Burragorang from the deck of the magnificent visitor centre, perched high on a rocky outcrop, or head down to the dam wall on weekends and public holidays ONLY for a close up view of the Lake. The lake created by the dam stretches back 52 kilometres from the wall. Nearby, Eighteenth Street Lookout provides the best view of the height of the dam wall and auxiliary spillway. Step inside the modern visitor centre and enjoy an even better view of the dam. Take a journey through the water cycle in the 'Water for Life' exhibition. Be amazed by the unique 'drops of wisdom' interactive table. Don't miss the children's activities, and ask our friendly visitor centre staff your questions. Relax with family and friends in the landscaped grounds. 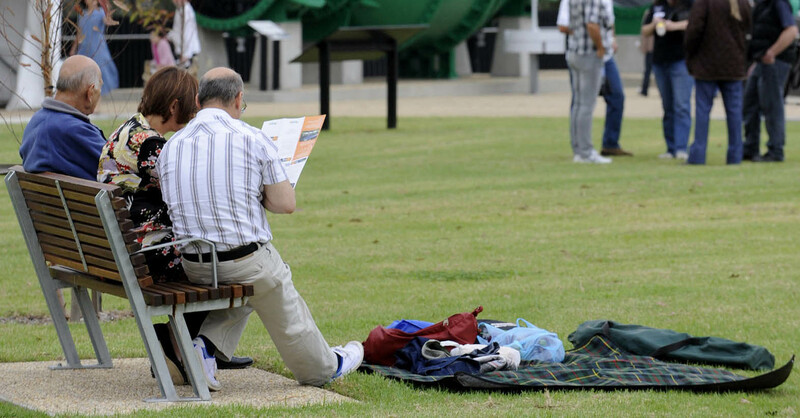 Throw down a rug and picnic under a shady tree or use one of our tables or shelter sheds. Drinking water and modern toilet facilities are scattered throughout the grounds. 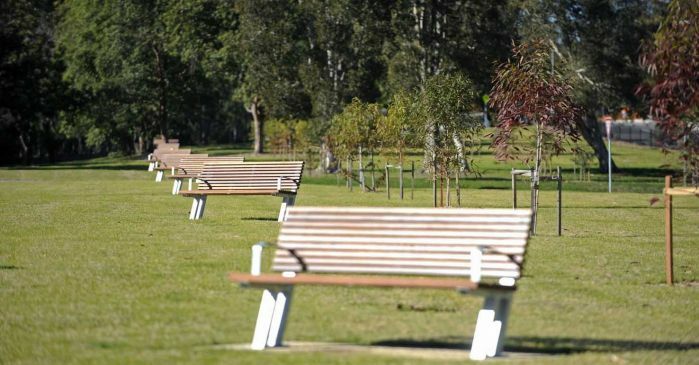 Barbeque facilities and a children's playground are located at the adjacent Warragamba Recreation Reserve managed by Wollondilly Shire Council, and Warragamba township has cafes and shops for hot drinks and meals. 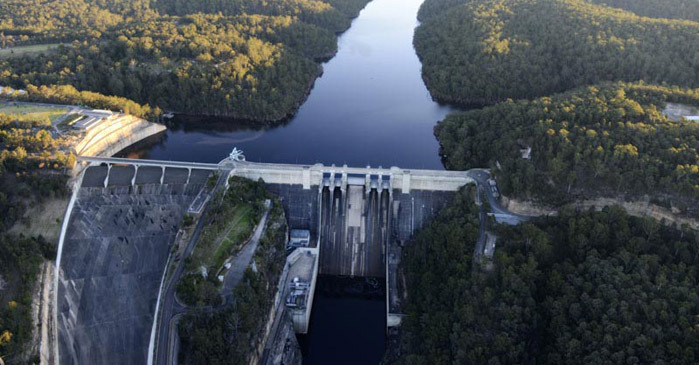 Located about 65 kilometres west of Sydney in a narrow gorge on the Warragamba River, Warragamba Dam is one of the largest domestic water supply dams in the world. 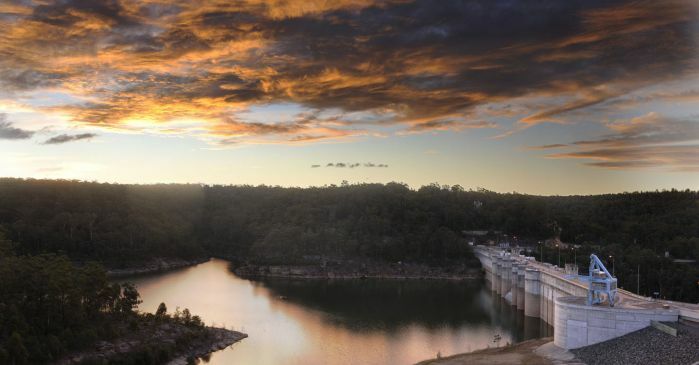 Created by damming Warragamba River and flooding the Burragorang Valley, the storage lake is four times the size of Sydney Harbour and stores around 80 percent of Sydney's water. Warragamba Dam supplies water to more than 5 million people living in Sydney and the lower Blue Mountains. The best quality water is selected and drawn through screens on three outlets in the upstream face of the dam. Water flows by gravity through a valve house into two pipelines that feed the raw water to Prospect water filtration plant and via off-takes to smaller filtration plants at Orchard Hills and Warragamba. A local Gundungurra Aboriginal creation story tells of two dreamtime spirits Mirragan - a large tiger cat, and his quarry Gurangatch - a part fish part reptile who lived in a lagoon where the Wollondilly and Wingecarribee rivers meet. During a long cross-country battle in the Dreaming (Gunyungalung), the deep gorges of the Burragorang Valley were gouged out. It was this valley that was flooded when Warragamba Dam was built. The location of the dam was first suggested in 1845. The deep narrow gorge of the Warragamba River, at the exit to Burragorang Valley, was identified as an ideal place for a dam by Polish explorer Count Paul Strzelecki. More than a century and many droughts later, work finally started in 1948 to build a reliable new water supply for Sydney's growing population. It took 12 years and 1,800 workers to build the dam, which opened in 1960. It was such a major undertaking that a town was built next to the site to house the dam builders. 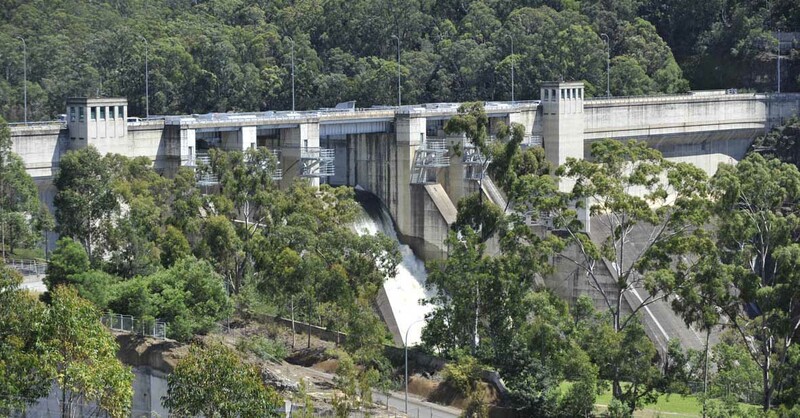 The Warragamba River offered two important advantages as a site for a major dam - a large catchment area, and a river flowing through a narrow gorge. A tall and narrow dam capable of holding a vast amount of water could be built. A population boom after World War I followed by the worst drought in recorded history, from 1934 to 1942, placed immense pressure on Sydney's water supply. However, despite the first sketch plans for Warragamba Dam being drawn up in 1867, plans were deferred during the construction of the Upper Nepean dams (1907-35), the Great Depression (1929-32) and World War II (1939-45). Warragamba Dam was a major engineering feat of the mid-20th Century. In 1946 the Warragamba River was diverted so excavation for the dam could start. Trees were cleared from the Burragorang Valley, and two temporary (coffer) dams and a tunnel were built to keep the site dry. More than 2.3 million tonnes of sandstone was removed. Concrete was mixed on site using 305,000 tonnes of cement and 2.5 million tonnes of sand and gravel. The sand and gravel was transported from McCann's Island in the Nepean River via an aerial ropeway. The dam was built in a series of large interlocking concrete blocks. Overhead cableways lifted 18 tonne buckets to place the concrete. Ice was mixed with the concrete to control heat generation and prevent cracks. One of the first pre-stressed concrete towers in Australia was built to house the ice-making plant. To get to the work site from Warragamba township, the dam builders used two suspension bridges, one across Folly Creek, upstream of the dam wall, and the other across the Warragamba Gorge just downstream from the dam. These Folly Creek bridge was removed after the dam was built but the bridge over the gorge was kept and incorporated into the beautification works at the dam. In 2001 it suffered damage in a bushfire and was subsequently demolished. To meet modern dam safety standards, in the late 1980s the dam wall was strengthened and raised by five metres. In the early 2000s an auxiliary spillway was built to divert floodwaters around the dam in a rare and extreme flood so as to protect the dam and ensure it remains safe in an extreme flood. A deep water pumping station was established in 2006 to allow water to be accessed lower down in the lake during times of drought. 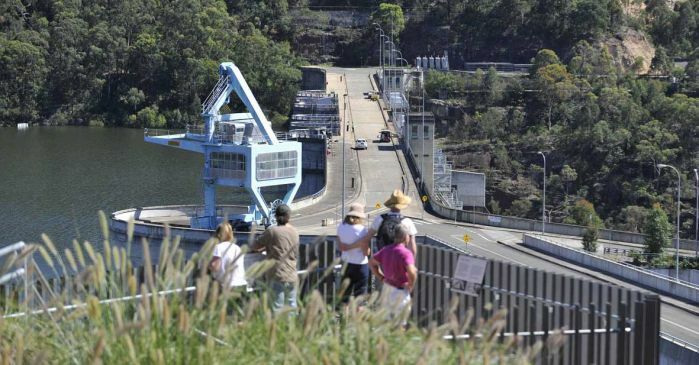 WaterNSW is currently undertaking maintenance works to the drum gate at Warragamba Dam as part of its dam safety program. These works will continue until late 2019. During this time there may be increased noise and truck movements at the dam. At certain times during the works, weekend access to the dam wall may be unavailable. Trigger - Storage level has reached RL 125.72m. Trigger - Storage level has reached RL 127.72m. Trigger - Storage level has reached RL 129.72m (30mm below dam crest road surface level). Trigger - Spillway flows (controlled) are expected. Drum gate starts to open – Trigger RL116.8m. (Drum gate fully open – RL117.02m). Radial gates begin to open – Trigger RL116.95m. (Radial gates fully open – RL118.55m). Regulated releases are when our operations may impact landholders immediately downstream or we are releasing higher than normal flows. Enjoy a picnic in Warragamba Dam's landscaped grounds. Take a self-guided walk around the dam grounds to multiple viewing platforms, interpretive signs and historic machinery. 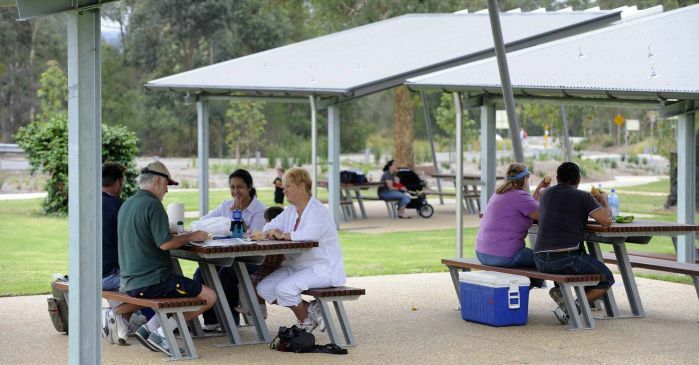 Modern picnic shelters are located throughout Warragamba Dam's extensive landscaped grounds. When completed in 1960, Warragamba Dam was the world's tallest and largest domestic water supply dam. It is 142 metres high, 351 metres long and contains 3 million tonnes of concrete. 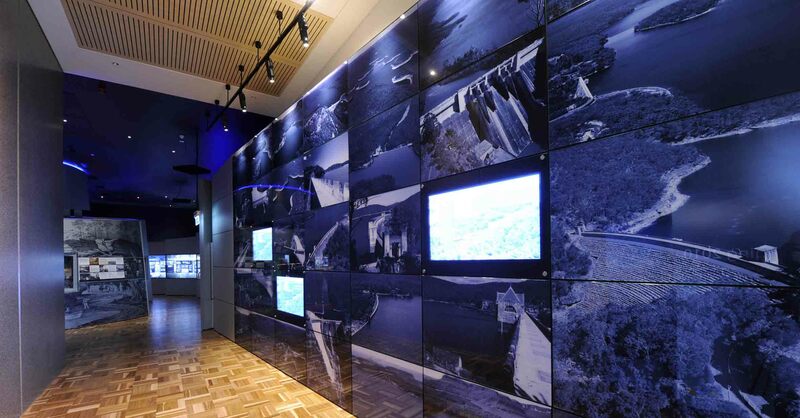 Warragamba Dam's modern new visitor centre hosts permanent and temporary exhibitions. 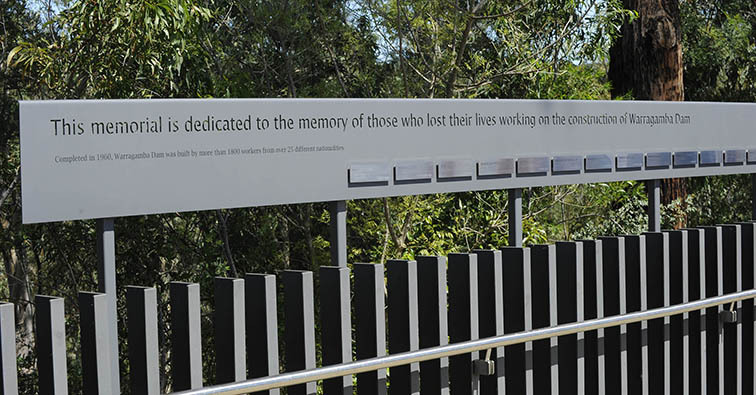 The Warragamba Dam Workers' Memorial commemorates the 14 dam builders who died during construction. Warragamba Dam wall, viewed through a zoom lens from the Eighteenth Street Lookout in Warragamba township. Warragamba Dam's grounds are open every day of the year. The visitor centre is closed only on Christmas Day and Good Friday. 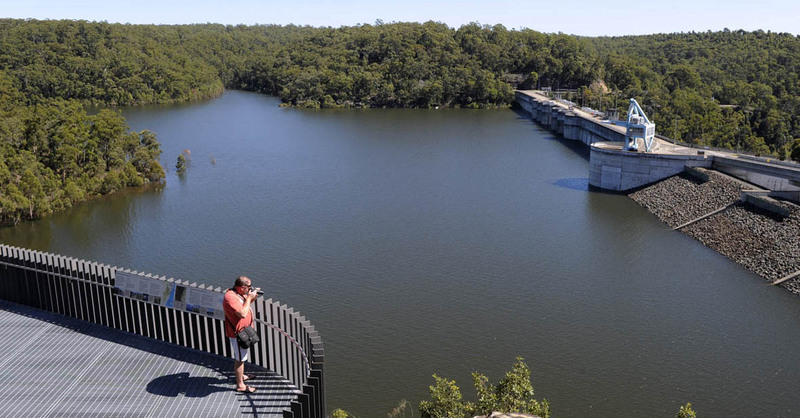 Warragamba township's Eighteenth Street Lookout provides views of the dam wall and auxiliary spillway. Warragamba Dam's grounds feature many viewing platforms with provide visitors with excellent views of the dam wall and lake. Our friendly visitor centre staff run children's activities in the Burragorang Room. 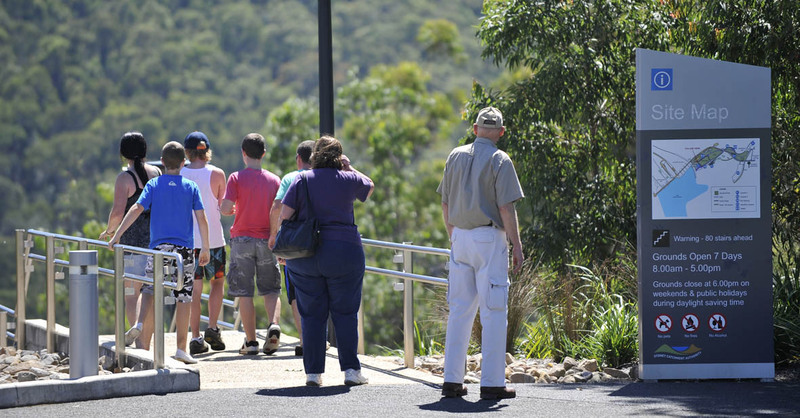 The visitor centre viewing platforms provide excellent views of Lake Burragorang and the dam wall. 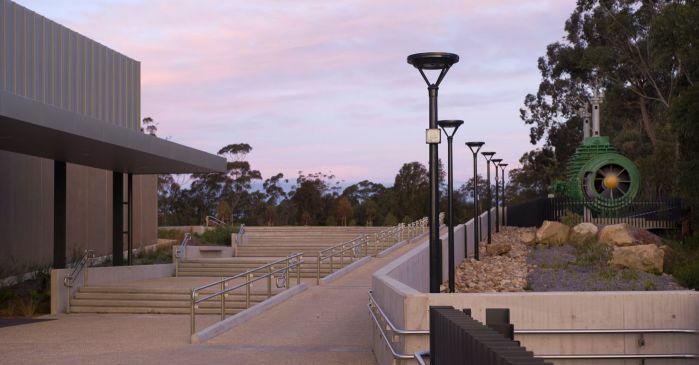 The Warragamba Dam visitor centre building also includes operational offices for WaterNSW staff. Next to the visitor centre is a giant valve, which was used to control the flow of water from the dam into the twin Warragamba pipelines. A spectacular sunset over Lake Burragorang and Warragamba Dam, viewed from the visitor centre. Warragamba Dam's modern new visitor centre hosts permanent and temporary exhibitions, children's activities and video presentations. 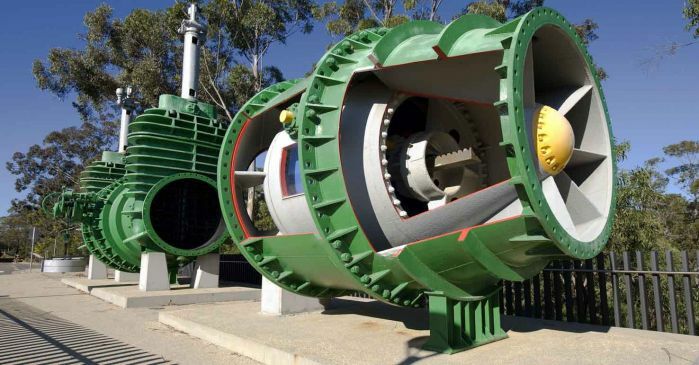 One of the giant valves, since replaced in the Warragamba Dam valve house, used to control the flow of water from the dam into the twin Warragamba pipelines. 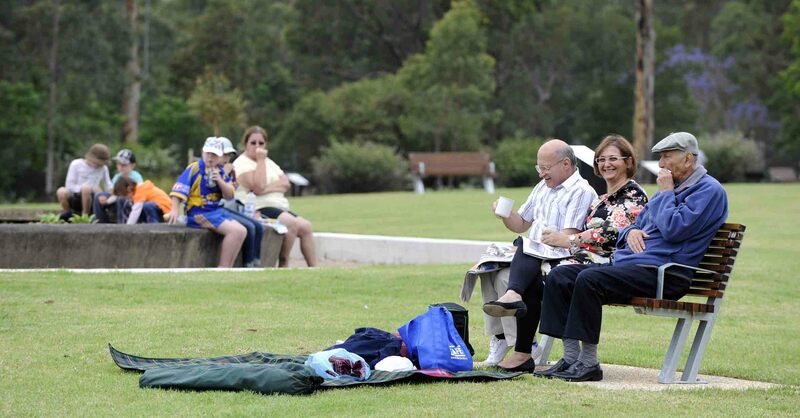 Warragamba Dam's landscaped grounds include modern seating as well as picnic shelters, drinking water and toilets. 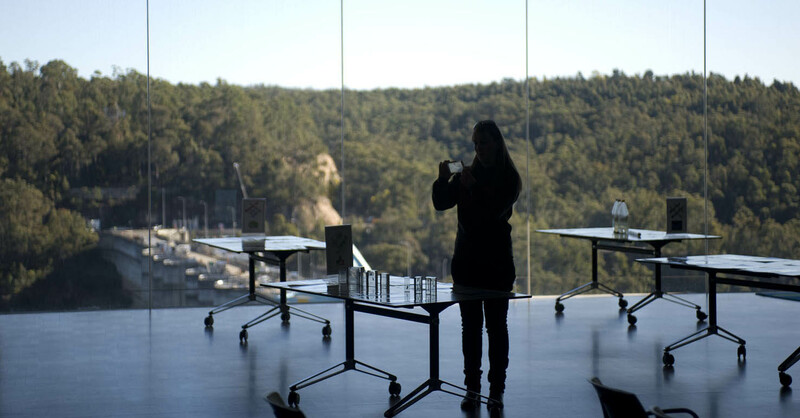 The Burragorang Room in the visitor centre boasts sweeping views of the lake and dam wall, and hosts children's activities and video presentations. You'll be amazed by the interactive 'drops of wisdom' exhibit in the 'Water for Life' exhibition at the visitor centre. 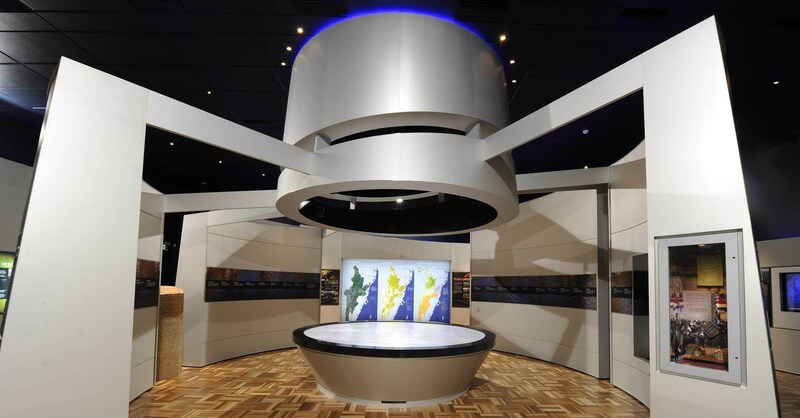 The 'drops of wisdom' interactive table is a highlight of the permanent exhibition at the Warragamba Dam visitor centre. 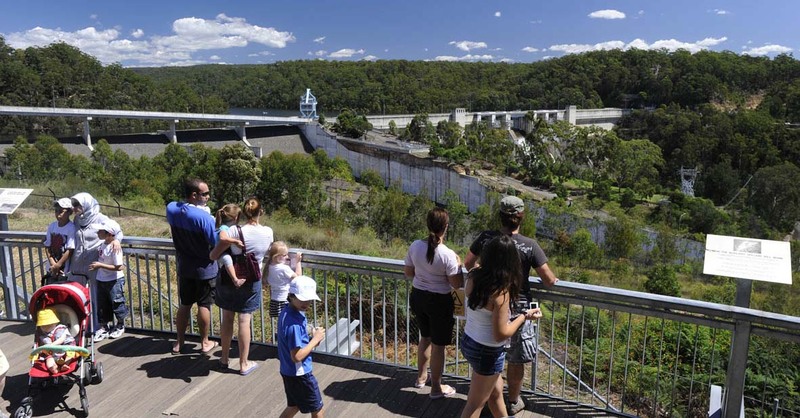 'Water for Life' is the permanent exhibition in the Warragamba Dam visitor centre. 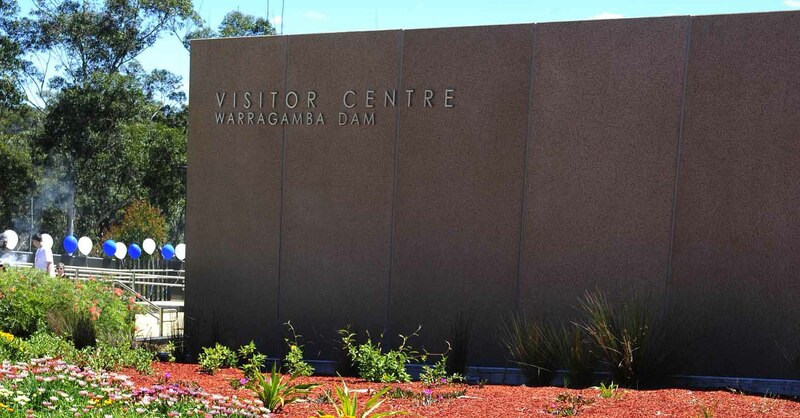 Our friendly visitor centre staff will answer your questions about Warragamba Dam.